LABYRINTH BOOKS Toronto Comics MANGA and GRAPHIC NOVELS - TORONTO: NEW BOOKS ARRIVING NEXT WEDNESDAY MAY 15th!!! NEW BOOKS ARRIVING NEXT WEDNESDAY MAY 15th!!! - A new magazine dedicated to Comics is in town sporting Alex Ross, a look at Jack Kirby, and many more salient topics! Grab the first issue of 'Comic Book Creator' this week! - The Marvel Universe is turned inside out, and who is going to take responsibility? Find out in the eighth issue of 'Age of Ultron'! - The first issue of 'Regular Show' arrives this Wednesday! Check out the comic book series based on Cartoon Network's blockbuster show, looking to prove as poplar as Adventure Time! - Fans of the Disgaea game ought to check out the new manga featuring life for evildoers at the Evil Academy! The first volume of 'Disgaea 3 School of Devils arrives this week! - If you haven;t quite had your fill of Negima yet, then check out the role reversal of 'Negiho', an alternate reality of Negima where all the girls are 10 year old students and Negi is the adult trying to keep them in line! - The third volume of the Neon Genesis Evangelion 3-in-1 omnibus arrives! Catch up on events as the manga draws to a close in Japan and get an idea of the excitement surrounding the new Rebuild films! - Adventure Time fans have two graphic novels to look forward to this week! The first the collected trade of the Adventure Time spin-off 'Marceline & the Scream Queens! And secondly, an ALL-NEW ORIGINAL Graphic Novel for Adventure Time featuring the Flame Princess! - The original run of 'The Authority' issues #1-12 by Warren Ellis & Mark Millar is collected in hardcover form and out this Wednesday! - Batman Beyond Unlimited #s 1-13 are collected in 'Batman Beyond 10000 Clowns' as gangs inspired by the original Joker run amock in Future Gotham! -The Justice League of the future is here in 'Justice League Beyond'! 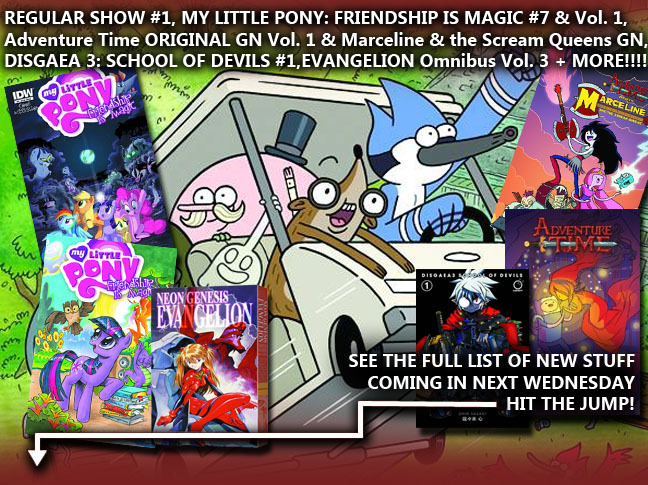 - Bronies missing out on the My Little Pony Friendship is magic comics can catch up this week when the first volume arrives this Wednesday! - Check out the new Bishojou statue with the female Commander Sheppard from Mass Effect! - For those of you inquiring about Star Trek Communicator Badge Replicas, we've finally got some in! Crafted and pain-stakingly detailed from the original mold!